Presented here is the next chapter in the history of Faruk Green’s keyboarder and founding member JEFF ÖZDEMIR… a compilation of soulful, pop & electronic inspired music. Jeff Özdemir, multi-instrumentalist, composer, producer and owner of the “33rpm Store”, an independent record shop in Berlin Kreuzberg, also runs the label 33rpm Records with some of his musician friends. The record store has become part of Özdemir’s own musical education, a place to experiment and discover new sounds and new bands. Over the years, his broad exposure to different eras & genres of music has had a strong influence on what he produces. And it’s these kinds of influences you’ll hear on this double vinyl, in the chords, rhythms, atmospheres, production styles, and sound aesthetics. Tune in to JEFF ÖZDEMIR & FRIENDS and you’ll find a colourful mix of all decades, continents, fierce micro-grooves, tempos, genres and genders. Released on this album are solo tracks he’s been working on for quite some time now, plus a handful of tracks done with collaborators and friends – hits Jeff is deeply in love with. Faruk Green, Jeff Özdemir and the whole local urban music scene around them are geographically located between the German cities of Bremerhaven, Hamburg and Berlin, but the dots connect across the globe reaching all the way to Vienna, Metz, Helsinki, Istanbul, Minneapolis, Michigan and Ghana. This compilation is an eclectic and unique album for people who like jazz-funk, indie, the German language, strings, record stores, vinyl, movie soundtracks, Moogs and pop vocals. 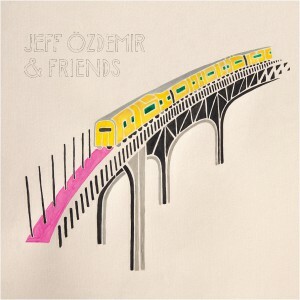 Sit back and enjoy the ride with JEFF ÖZDEMIR & FRIENDS. And rest assured, volume two is already being worked on as you listen. I discovered this album and 33rpm records while peeking on here to write a review of Post Industrial Boy and I now have 33rpm’s soundcloud music playing and I’ll be happy until sunrise! Yeh Adem! Beautiful sounds and textures, every track is such a pleasure to hear….going to have this one on repeat for a few weeks! Really good sounds & they must have fun recording this beautiful music!